This unique spa basket was tastefully designed especially for women. She will be eternally grateful when she gets to enjoy the day pampering herself with some of the exotic bath and beauty products carefully selected and arranged in this spa basket. Her indulgent home spa treatment features a charming butterfly planter box filled with an inflatable terry cloth bath pillow complete with suction cups for a truly relaxing bathing experience, a body sponge, a hardwood manicure groomer, terry bath slippers, a loofah and terry bath mitt, a very elegant ceramic keepsake frame, a wonderful bath and body scrub, bath salt, a refreshing shower gel, all lightly scented with the soothing fragrance of Pomegranate and to truly indulge her, a box of decadent Chocolate Truffles! This exquisite home spa collection is trimmed to perfection with life-like silk floral accents, ribbon and bows! Itís a wonderful keepsake gift! This is the time to treat the woman in your life to a day at the spa! 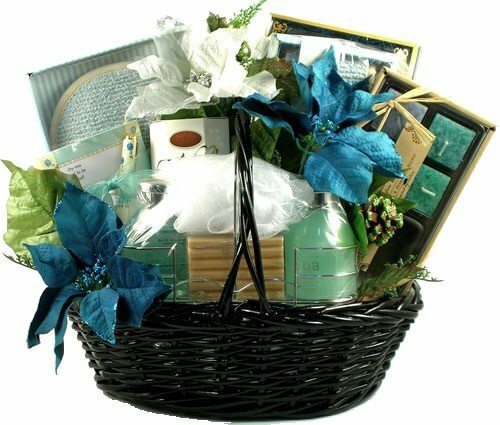 Our ''Spa Day'' gift basket for women offers an assortment of luxurious spa products that will help to relax, rejuvenate and revitalize her. †Itís a memorable way to treat someone special to a day at the spa right in the sanctuary of their own bathtub!